This is a page from my set of 11puzzles. If you like it, please click here for the whole set. 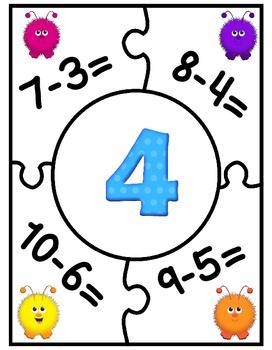 I have created 11 different subtraction facts puzzles. There is also a recording sheet for accountability. These can also be used for higher first grade and lower 3rd grade students. This is a great and different alternative than having your students doing a traditional worksheet to practice their math facts.